Duo Nouveau began to form their musical partnership together since 2010 at The Daejeon Chamber Music Festival hosted by Korean Broadcasting System in South Korea. As they were continuing their studies at Boston University, they played in many recitals and masterclasses with Anthony di Bonaventura, Michael Reynolds, Robert Merfeld and Mihai Tetel. Their performances also include concert hosted by Steinert & Sons(Natick, MA), American Protégé Piano and Strings Winners Concert at Carnegie Hall(NYC) and Arts Outreach Initiative at BMC(Boston, MA). a native of South Korea has appeared as an acclaimed soloist, chamber musician and orchestral musician throughout North America and in Asia. Beginning playing the cello at the age of ten, she studied with emeritus professor Chung Shim Baik at Seoul National University in Korea and continued her studies at New England Conservatory and received her Doctor of Musical Arts degree at Boston University. She participated as a fellow musician at Aspen Music Festival, Pacific Music Festival, Tanglewood Music Festival and performed under the baton of world renowned maestros including Charles Dutoit, Christoph von Dohnányi, and Rafael Frühbeck de Burgos. She has won numerous competitions, awards in US and Asia and recently performed as a soloist with Boston University Symphony Orchestra and Arlington Philharmonic Orchestra. Throughout her musical carrier, she has performed at various venues including Carnegie Hall, Kennedy Center, UN Center and Boston Symphony Hall and was invited to Peabody Institute Library and Brookline public library concert series. Currently, Mrs. Lee is engaged with Symphony New Hampshire and Hwaum Boston Chamber Orchestra. Yoojin Lee, has extensively performed throughout Korea, Europe and the United States. 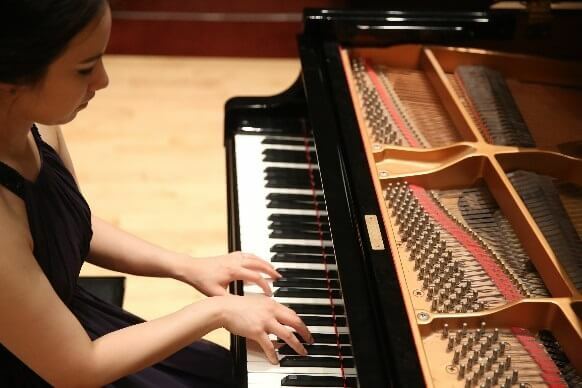 She has earned Bachelor’s of Music in Piano Performance at Sookmyung Womens University in Seoul, South Korea, where she studied with professor Hae-Jeon Lee. She continued the study of Master’s of Music in Piano Performance at Manhattan School of Music receiving the President’s Award under Dr. Marc Silverman. Ms. Lee received Doctoral of Music in Piano Performance at Boston University under Pf. Anthony di Bonaventura and Pf. Pavel Nersessian. Yoojin Lee has won numerous competitions such as, The Music Educations News Competition, Han-Eum Competition, The National Students Competitions, The Lilian Fuchs Chamber Music competition, American Protégé Piano and String Competition and so on. She has also performed with Janacek Philharmonic Orchestra, in Czech Reublic and Andiemusik Philharmonia in South Korea. Furthermore, Ms.Lee has appeared in The Lives of the Piano Series- Mendelssohn 200th Anniversary Concert in Manhattan School of Music, The Lillian Fuchs Chamber Music Competiton Winners Concert, ALEA III (Contemporary Music Ensemble in residence at BU), and BLMA Concert Series. Subscribe with your email address to recieve news and updates.